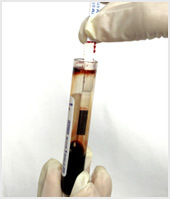 Biological Fluids - Collection of biological fluids such as blood, serum, plasma etc. are very common in both, research and clinical applications. Most of the assays that are performed with these fluids require a very small amount of the starting material. TruStrip™ STS technology has been successfully used to collect biological fluids, store them in a dried format, and recover the samples for further analysis as needed. Purified Proteins and Antibodies - Standard methods of storing purified proteins and antibody solutions typically involve storage in tubes under refrigerated or frozen conditions, which requires adequate storage space. Alternative methods involve storing the material in desiccated form, which is a time-consuming process. Purified proteins and antibody samples can easily be stored in a desiccated form on TruStrip™ strips. Large number of such strips can easily be stored in a small amount of space. Importantly, samples stored on TruStrip™ strips have been successfully demonstrated to maintain full biological activity upon recovery of the samples in a suitable buffer. DNA Samples - TruStrip™ STS technology is excellent alternative to the standard DBS (Dried Blood Spot) technology that involves ordinary filter paper-based sample collection method. With its ability to collect and recover samples in a quantitative manner, the TruStrip™ STS technology enables easy collection, storage and shipping of DNA samples between different facilities. TruStrip™ STS technology has been successfully demonstrated with plasmid DNA to retain structural integrity and functional activity upon recovery of desiccated samples from the strips. Forensic Samples - Collection and storage of forensic evidence samples is particularly challenging for a variety of reasons. The ability to collect as little as 5 µl of samples in a quantitative fashion and ease of storage plus cataloging the samples with the combinatorial tags makes this technology ideal for forensic applications. Samples from small animals - Typical sample collection from small research animals such as mice, rats or rabbits involve the use of a needle syringe to draw the samples. This procedure requires a lot of skill and can often be cumbersome. TruStrip™ STS technology solves the problem of quantitative sample collection and makes it very easy to store and catalog large number of samples for bioanalytical research applications. Biological sample collection in field - A major challenge in collecting biological samples in the field, or remote locations, is the lack of adequate resources and facilities to collect and store quantitative amounts of samples. Same is true of sample collection in veterinary settings and applications. The ability to collect quantitative amounts of samples using TruStrip™ strips and storing it in a dried format is well suited for all field-based applications. Infectious samples collection - The unique feature of TruStrip™ STS technology that enables quantitative collection of samples by merely bringing the strip into contact with samples that are potentially infectious makes it ideal compared to other conventional sample collection methods. Additionally, infectious pathogens can readily be inactivated by inclusion of denaturing agents in the sample pad, making this technology even more attractive for these applications. In performance testing and validation of 3 critical parameters that included sample load capacity and recovery, preservation of biological activity, and sample stability, the TruStrip™ STS technology met or exceeded all expected benchmarks, as shown in the table below.